Retail sales climbed by just 0.1 per cent in January. While this number may seem week, it was right in line with expectations. And it was seen as confirmation that the initial impact of the recent payroll tax hike wasn’t any worse than expected. 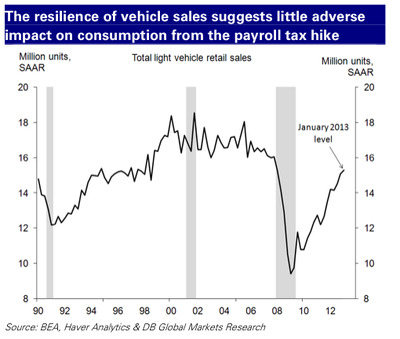 However, Deutsche Bank’s Joseph LaVorgna and Carl Riccadonna are particularly encouraged by one component of the recent retail sales report: auto sales. Still, LaVorgna and Riccadonna will wait for the January income and spending report before they get really excited. …the January personal income and spending report, which is released March 1, will provide significant additional information with respect to households’ behavioural response to higher tax rates. In that report we will be watching in particular to see the overall trend in income growth (i.e. the dispersion between December and January due to tax optimization—this applies to both dividend and wage income), as well as the degree to which households may be dipping into savings (i.e. a lower savings rate) to support current quarter consumption.